For this guide I will show you how to defeat and kill Belranga the Crystal Spider Mega Boss. Personal information: I spent tons of time to prep for this fight and I have replayed it 20-30 times only to lose when she gets down to 10% HP. I know how it is to fail, but I finally did it. And here is how I did. Characters and Classes: How to Make a Good Character. Mage with 15 arcane skill. I did want a pure chiper, but sadly I always multiclassed everyone that had chiper class during the main campaign. Shark Soup (resting bonuses) (immune to paralyze effect) - super important (basically impossible without it unless you play on cakewalk level. Nemnok (Pet) - more healing. But other lower recovery bonus pets is also good. General good items (you decide) (poison resistance and high armor class helps). Max level (I had 3 on max, 2 on Level 19). Blunt damage weapons (clubs, morning star etc) in one slot, ranged in second slot. Try packing corrade damage abilities as these are the best. She has huge resistance to everything else. As you can't get blunt damage on ranged weapons you will do way more damage in melee. But it has it cost. Healing potions, healing scrolls, scroll of maelmstrom (if you have 15 arcane), Luminous Adra Potion (at least on your tank), resurrection scrolls and summoning items. So basically you eat a bunch of shark soup before battle and equip the correct item, scrolls, weapon etc. Sneak your way to the top and defeat the first spider nest without gaining any attention. Once it is done, rush over to her. Attack with the spider nest right beside her with your main tank, and destroy the other with the rest of your party. Damage one more nest to 10-20% health. Then help your tank destroying the nest he was working on. 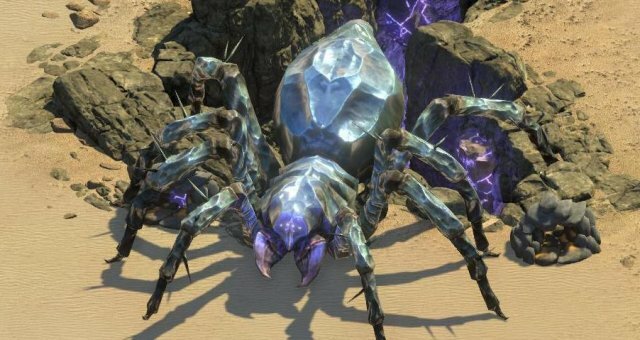 Have one companion defeat all the spiders around while you clear those nests. Try moving around so she can't engade you melee as most as possible, you need to kill a few spiders before you rush her, and now that you destroyed every nest on one side, they should all come from one direction. So go to that area with the rest of your squad (right or left depending where you started and defeat those spiders). Don't destroy the nests but get them down to 10-20% if you can. Have a healer close to your tank so he don't die while he running around and taunting Belranga. Once you have killed 90-100+ spiders, destroy the rest of the nest and engage her. Now be careful as she deals insane damage each attack. Have your priest focusing healing and remember to use your abilities. This is it. When she is 75% or less she will use the "consume" ability, so keep that in mind. Few way to avoid it except keeping her at a distance and that is hard at the moment. This is also when the resurrection spells and Luminous Adra Potion get it's play. Don't have a melee fighter attack her with 2 or more injuries. That is like begging for a perma death. Keep her at a distance with summoning spells or summoning items (now is the time to use it.) She wont be able to reach you in time and you should kill her before she eats the rest of you. You might need a few tries to manage this fight, but this is a great way to defeat her without using any dirty tactics. You get tons of adra afterwards, some spider legs and a mediocre+ trinket. Not the greatest treassure, but now you defeated one of the (if not the actually) hardest emeny in the game. At least untill they add more mega bosses. And I have heard there is one in the last patch.